Kings XI Punjab, the IPL team joined hands with digital payments company, ItzCash to drive the agenda of ‘Cashless India’ backed by our honourable Prime Minister. ItzCash is the principal sponsor for Kings XI Punjab in the current season of the Indian Premiere League. The ‘Cashless India’ vision, besides digital empowerment also focuses on creating a digital infrastructure as a utility for every citizen. Reiterating the agenda, ItzCash took up the onus of spreading awareness while leveraging cricket as a powerful influencing medium for a country like India by pledging for the digital drive. A formal meet & greet session was hosted for the players at the Hyatt Regency, Chandigarh on Saturday. 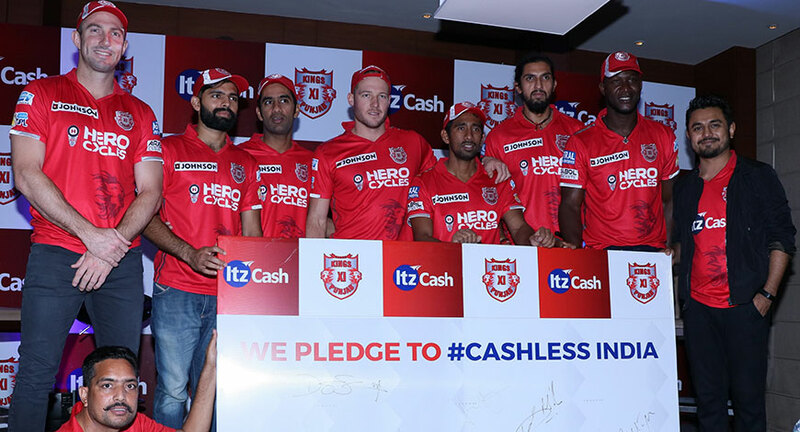 On the occasion, the players along with the senior leadership team at ItzCash took to the stage to pledge to go cashless. A pledge board with the narrative 'We pledge to #Cashless India' was put on the stage which was signed by the players. Players present included David Miller, Shaun Marsh, Manan Vohra, Darren Sammy, Sandeep Sharma, Ishant Sharma and Gurkeerat Singh Mann. Mr. Bhavik Vasa – Chief Growth Officer – ItzCash was also present at the event to co-jointly promote the national agenda.